aww he is sooo adorable!!! I love your outfit! You are right, it is airy yet cozy looking. I love the combination of knit items and that floral dress. Booties are cuute too. And your dog is so cute! Ah! It's just, he's so small! He will get cold easily. You had to put a sweater on him! HEHEHHE He's sooooo cute! Our only rule when we got a dog was that he wasn't allowed to wear clothes - husband's rule, not mine. It didn't last very long. The best is a little Penn State sweatshirt with a hood and pouch pocket. So cute! awww your lil puppy look so CUTE! and you dont look so bad yourself missy! Love those booties!!! And your dog is very handsome, love the sweater!! Igby is ADORABLE!!! 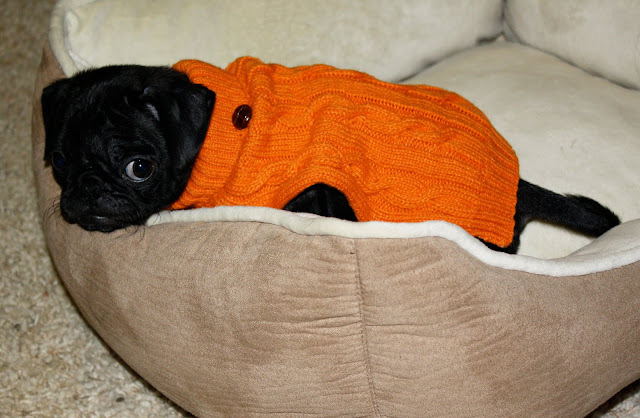 I love the sweater on him, too cute! Oh, and don't worry because my husband and I are THOSE dog owners as well, but our little westie/russel mix shivers too. He has two sweaters, and we are taking him to Howl-O-Ween, so he even has a fleece turtle costume. Aww so adorable! You both look totally amazing... and perfectly cozy! The girl with the dog. Not only do I always enjoy your outfit posts, but now you have adorable puppy pictures too! I love your skirt and tights. I love this outfit and the treatment to this photo! that dog is very cute as well! you look very warm but still very chic! and i think this blog is very neat! your puppy is too cute. I love the sweater it look so comfy! 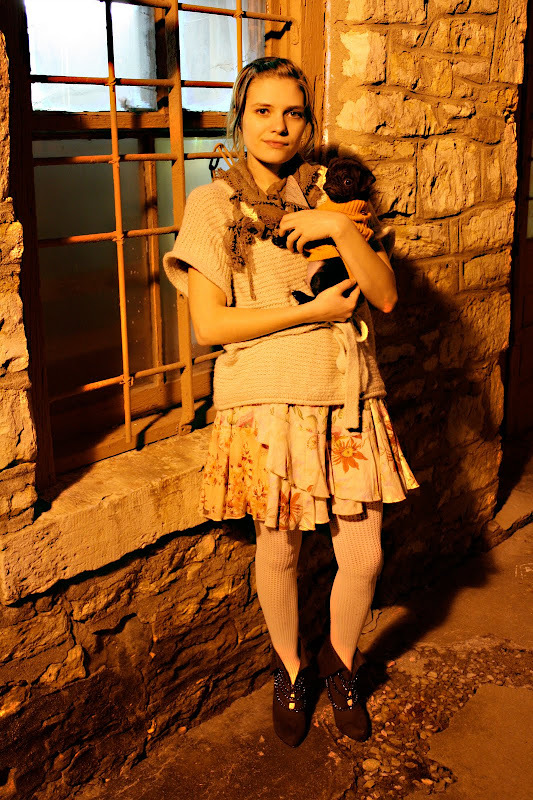 love your cozy outfit, and oh my gosh, your puppy is so cute. i love pugs! I love how you two match! I love the cozy sweater and tights and those cute little boots! wow....i really love your dog...and his sweater! I love your remix of a skirt as a dress...it looks perfect! Your little guy is absolutely adorable! He looks so warm and snugly! Great outfit and beautiful picture (amazing colors)! I love the way you layered the dress and sweater! They look great with the booties. your shoes are as cute as your dog? Did you add the embellishment to the booties, or is that how they come? Are they new, or from a past season of Abaete at Payless? oops! I apologize, that was not supposed to be a "?" after the word "dog"....I meant it to be an exclamation point!!!!!!! "Your shoes are as cute as your dog!" cutest pup in the midwest! that outfit looks so cozy! and your dog is ADORABLE!! awwww, your puppy is soooooo cute! Nice cozy outfit... and igby's sweater is sooo cute!!! I am "one of those" dog owners too... my dog has a whole wardrobe and I treat her like my own child. It's a totally unexplainable feeling! Igby is adorable in orange. It is his color. You look adorable and the puppy is so cute!!! I love your wee dog sweater! Where did you get it? We have two small devon rex cats that also feel the cold (especially in the cooler climes of the antipodes). Love your stuff, keep it up!